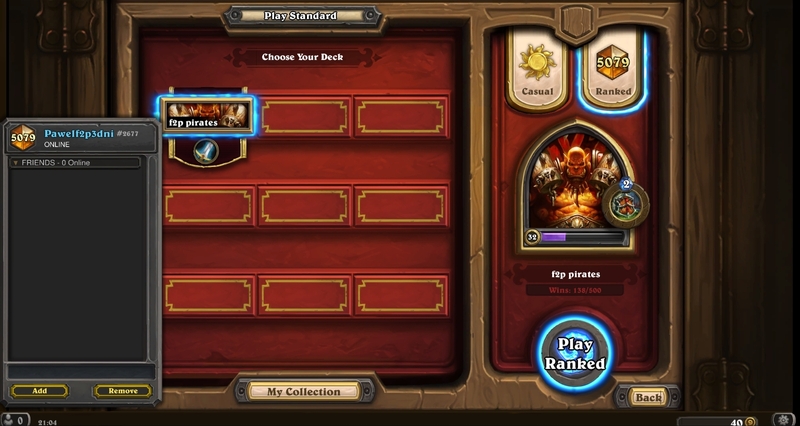 Hey guys, I'm PawełHS, a multiple-legend player from Poland with a few top 100 finishes. Recently I hit legend on all 3 servers, so I thought it would be a nice idea to take a harder challenge. I tried to get legend on EU in 3 days, on a completely new account. I played a lot of pirate warrior in the past with some reasonable success, so the deck choice was obvious. I only needed to have 1 successful arena run (10-3) + free Old Gods packs to make the deck, as the whole deck costs 1480 dust. My final stats were 138-75, so around 65% winrate. The whole gameplay from 25->legend you can find on my twitch and youtube. Is it good now, i read the comments and i want to try this deck out, but i dont want to waste my dust if this deck isnt viable now. I dont need to get to le, but i want to have fun with it and win a few games now and then, i dont want to get destroyed every game i play. At Youtube I only can find the videos 1/6 and 2/6 (uploaded 3 month ago). Where are the other 4 videos? I have Upgrade! and Bloodsail Cultist only 1x. What do you think about a replacement with 1x Malkorok and 1x Commanding Shout? Wow I'm really happy I found this deck. I am a newer player and haven't been able to get past level 17 since I'm missing the usual legendaries. After this deck I was able to get down to 13 in a couple of days. I think with this deck its important to remember that you will lose quite often, when you hit a taunt wall or a crazy control. You move forward by getting a couple of wins in a row and getting the bonus stars. So don't expect to win everything and do expect to conceded on a regular basis. But when you hit the right cards on the right person you will destroy them so so fast! Here's an icy veins guide on this deck for those of you asking for gameplay tips. I haven't won a single match so far with this deck, what am I doing wrong? Can you put some gameplay tips in the description? Tried to spend all my dust on a deck that would work. Now I'm fucked. there obviously isnt anything wrong with the deck if a player can hit legend with it in 3 days. either you got super unlucky or you are just a bad player. How do you feel about Charge? It's a nice combo if you can equip Arcanite Reaper and then next turn drop Blood Sail Raider and Charge (technically you could have enough mana to use Upgrade! too). That is the dream, but even still there are a few good targets for Charge (a discounted Dread Corsair or a Frothing Berserker), and in a pinch you can use it for the +2 Attack if you are close to lethal! I know it is a bit clunky but adding 1 Charge could work out well. I've played (and enjoyed) almost every variation of aggro. This however is the only deck where I've reduced my opponent's health to zero on turn 5.
i'm back once again to sing praises of this deck. it had a very difficult time between ranks 17 and 14, even now, at the end of the season. but once i got through those i went on 5-6 win streaks. i just wanted to get to rank 10 before the season ended. managed to get there and then decided to just play until i lose. i proceeded on a 9 game winning streak and finally lost to a dragon warrior (mainly because i never drew a single weapon) to end at rank 8 + 2 stars. but by far the best feature of this deck is not the consistency, but the fun factor. it's just a blast to play, even when you lose. Looks like a good starter warrior for me. I wanted to do a pirate warrior as I have a lot of pirate cards and basically no legendaries past the expansion ones that I could probably even use on a warrior. Do you have any more pirate themed decks that kick arse, please? I wouldn't mind taking a look for some tips. but win or lose, the main thing is this deck is FUN!!! started a new US account this month and am rank 7 now with this exact deck. thanks dude !!! love it. No Battle Rage? I feel like this deck needs card draw desperately. You can opt for +1 Sir Finley Mrrgglton -1 Blood To Ichor. Kinda standard for aggro. Lock > Hunter hero power. Armor is not useful for this deck. I started an f2p run on NA servers this July. I was able to build the deck in 3 days from scratch. Now I am rank 12 with 13-4 76,5% winrate. Thanks for the deck!